The M Gourmet Collection represent the traditional and popular Quebec's traditions. By the more traditional packaging but maily by the darker maple syrup we use to process our products. 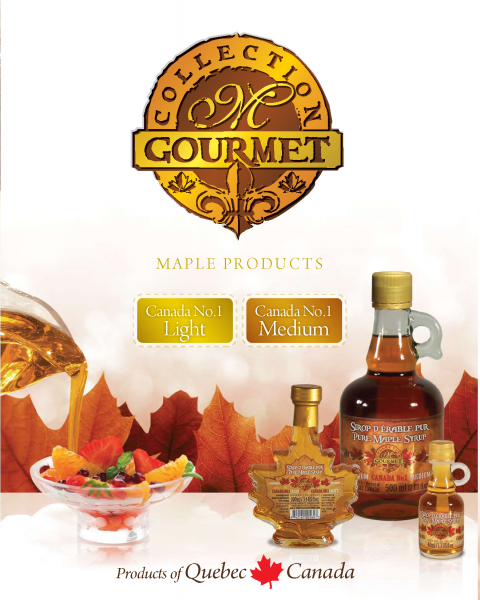 This line contains maple products made only with pure maple syrup from grades Canada NO1 LIGHT and Canada NO1 MEDIUM. WHY NOT CHANGING YOUR EXPERIENCES OF THE FLAVOURS REGARDING TO YOUR MORNING HUMOURS!